A special request was made as part of the multi-phased redesign of this expansive Southampton retreat; try to establish a transitional space out of a seemingly unusable stretch of side property. The team at Green Island Design envisioned and executed a stately courtyard with corresponding water features. This mini-promenade is of inlaid, tumbled travertine set in a French pattern, with the reflecting pools dressed in contrasting East West stone veneer and capped in traditional Bluestone. The modern, sheer descent waterfall pillars are adorned in shimmering, smoked-glass tile. 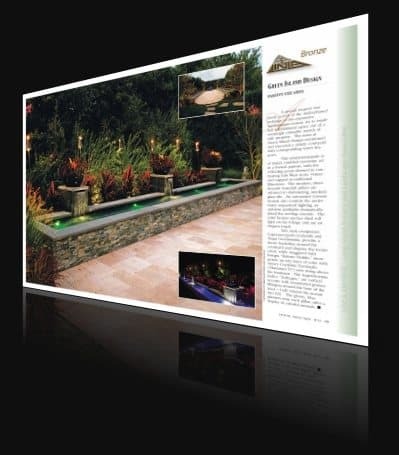 An automated Creston System also controls the under-water sequenced lighting, as ambient spotlights dramatically detail the arching cascade. The solid bronze torches shed soft light on the foliage and are an elegant touch. Tall, dark evergreens: Cupressocyparis Leylandii and Thuja Occidentalis, provide a dense backdrop around the courtyard and disguise the tennis court, while staggered Salix Integra “Hakuro Nishiki,” incorporate an airy layer of color wth showy Cordyline Terminalis (“Hawaiian Ti”) seen rising above the fountains. The Lagerstroemia Indica “Tuskegee,” are vertical accents with ornamental grasses filling-in around the base of the trees – both extend the season into fall. The glossy, blue planters atop each pilar, offer a display of colorful annuals.